Author’s Note: I’ve had a few people ask me how I got started with creating my own decks, and the process that I took to get to completion. After a quick search on the internet, I didn’t really find an answer to share with them, so I thought I would write my own. 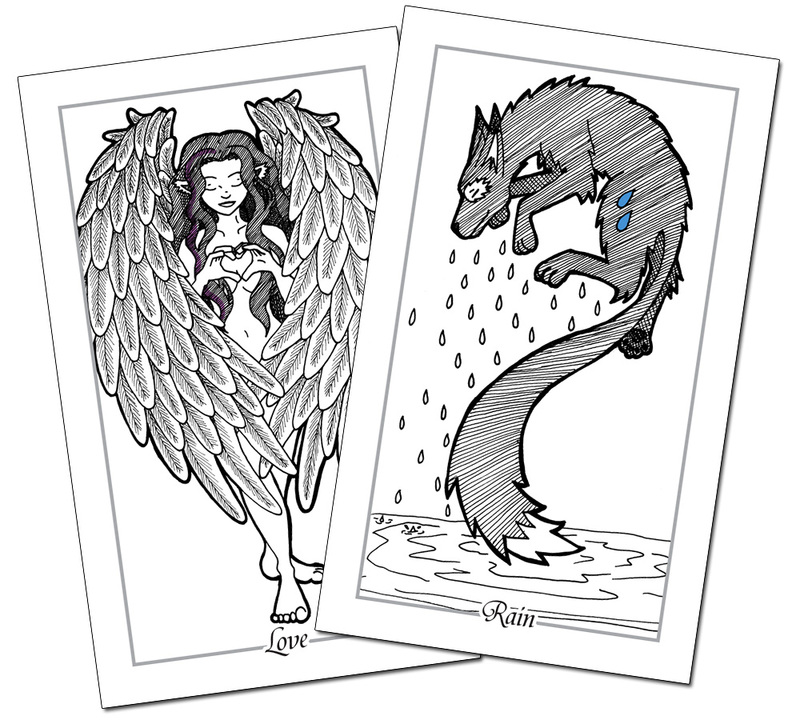 Some of these steps would carry over to make your own tarot deck, but since tarot already has a structure and designated image properties to it, you can probably skip some of the steps I outline below. Every deck I’ve created starts with an inspiration of some kind. I usually write it down, file it away and come back to expand on it when I feel I have something to add. This way I have some sort of theme or cohesiveness to the deck. For Spindle Cards, this inspiration was a resting element, that you could call upon when needed. From there, I started writing a list of cards I would want to include, and eventually narrowed it down to 60 cards based on my chosen printer and costs at the time. Seems a bit strange to start with a printer first, but I didn’t want to be left with a printer that would leave me with not enough cards, or blank cards in the deck. Therefore, the size of my decks were guided by the printing outlines set by printing companies. For Spindle Cards, the printer would print card decks in multiples of 10. After receiving the product, I wanted to work with a different shape of card for my next series (Spirit decks), and chose to look into a different printer. This own works in multiples of nine. Therefore, with this in mind, I started creating the outline of my deck with a multiple of nine. I landed on 36, so that once my next decks are created, they can be mixed and matched to create a larger number of cards to work with. This number also worked with the basic lists that I had started and broken apart. I recommend you research several printing companies, their costs and their (ever important) shipping costs, as this will be an added expense to your deck(s). This will also depend on whether or not you are creating a single deck for yourself to use, or many decks with the intention to sell them later. Now that you have a rough idea of how big or small your deck can be, determined by your choice of printer, you can start to outline your content more specifically. For me, this usually means a long list of cards that I would like to include, and trimming it down to ones I can’t live without, and ones that are needed to balance out the deck. With Spindle Cards, I created a list of everything I could think of that I would want to include, then broke them into their elemental groups. Some cards didn’t make the cut, especially if I had too many of one element and not enough of another. I needed to keep balance in mind when creating the deck, so that there were enough cards to cover a variety of emotions and states of being. This can be a difficult but rewarding step. In the case of Spindle Cards, I actually skipped this step and went straight to the artwork, so I don’t think there’s a right and wrong way of doing things. I drove straight into the artwork and let the name of the card itself inspire me. Once the artwork was done, I would study the card and pull from it the meaning I wanted to include in my guide booklet. You could easily work the other way around, and draw your inspiration from the meaning of the card and put it into the detail of your art. There’s no wrong way of doing this, unless you’re using artwork/photographs/anything that is not your own. Get permission from the artist if that is a route you want to pursue. Create an image that you feel fits the name and/or meaning of the card. There’s no wrong answer. It’s your deck. It’s your art. If you’re not happy with it, or struggling with a particular card, set it aside and come back to it. I always jump around in my list, drawing whatever I feel inspired to do at the time. Sometimes I would draw five cards in an evening, and sometimes I might not even finish a card. Creativity is strange like that sometimes. This step can really be done at any time, hence why it is sort of slotted in between other steps. At some point, you will need to work on a design for the back of the card. If you want the cards to be able to be read in a reversible position, this design will also need to be the same no matter which way it faces. If your cards are to be read in only one direction, you can have an asymmetrical design. I recommend keeping things fairly simple as far as colours go, but again, there’s no real right or wrong answer to this. Just make sure your printer is able to get all the card backs to be the same. See if they have a pantone colour system to ensure accuracy. This is something I missed in my Spindle Cards, which have a grey back, and there are slight differences between the greys within a single deck. 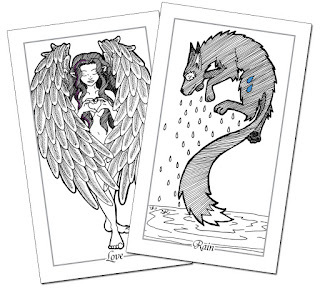 Once your art is done, and you have suggested meanings for each of your cards, you’ll need to be able (either by yourself if you’re design-handy or by someone else) to prep the cards into whatever template or specs the printer wants. You should have an idea on what this is from Step Two, where you researched your chosen printer. This will include sizing the art correctly to fit within the determined safe zone, adding any bleeds required and adding any borders or words to the card if you didn’t do it during the art phase. Most printing companies can offer advice on how best to approach this, so work with your printing company if you have any questions or concerns on how to prepare the cards. If your printing company does not offer a printed proof, you may just have to buy a single deck to see how things look. I ended up making some alterations on my Spindle Cards because some colour-spots were too small to see once printed, and I even ended up renaming one of the cards -- once I had them all together and in front of me, I realized the name wasn’t quite right. Having a proof is important as well, to make sure your “Safe Zones” came through correctly. Sometimes cutters are a bit off, and will trim your card slightly to one side. You can’t really prevent this, so it’s important to see how the finished product looks before you go ordering a whole set of them. Never spend money you do not have. Sorry, but I’m a stickler for that. If you want to sell your decks, that’s fantastic! However, you need to be aware that it might take time, and if you borrow money to get your print run done, it could take a long time before you are able to pay that money back. Save up money to get your print run done, and then when you sell the decks you are paying yourself back. Victory! That said, you can always turn to crowd-funding if you are comfortable with that option. I took my Spindle Cards to Kickstarter after I paid for my proof out-of-pocket. I wanted to be able to make sure people were interested in buying my decks before putting out the money to get them made (which, for those interested, was between $1,200 and $1,600 for about 72 finished products - decks, boxes, booklets, labels). The number is a bit fuzzier than I would like, because I didn't write everything down in the beginning. If you want to sell your decks, make sure you record every expense, so you can properly price your deck and earn the money back. If you want more information on crowd-funding, there are lots of great articles out there. You are the salesperson/promoter: You are the one speaking with customers and trying to pitch your product to them. You are the one who travels to areas, sets up shop and takes things down at the end of the day. The benefit: After paying any fees for spaces you might have been in, all revenue is yours. The downside: It takes time, heart and a lot of people skills. You let someone else be the salesperson/promoter: This includes online platforms that will allow your product to be seen by others, or placing your deck into a store on commission. The benefit: You’re putting your work into the hands of professionals, who can probably reach a lot more people than you can by yourself. The downside: Commissions and fees that you will end up paying. This means you will earn less for each deck sold, or your deck will be marked up in price. That is about it, as a basic get-started guide on creating your own tarot/oracle decks. I hope it helped! Please email me with comments at info@wildhusky.ca or message me on Facebook at Wild Husky Publications.